Commemoration Ceremony and Parade on the occasion of the International Day of United Nations Peacekeepers. 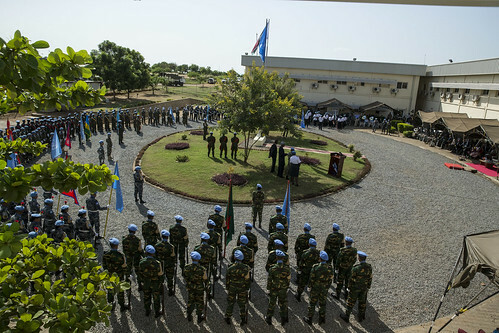 The event was held in Juba, South Sudan on May 30, 2016 at the Headquarters of the United Nations Mission in South Sudan [UNMISS] under the theme 'Honouring Our Heroes'. Under a veil of silence the names were read of the 13 Peacekeepers that lost their lives while serving in the United Nations Mission in South Sudan in 2015. They were UN Volunteers, National Staff, International Civilians, UN Police and Military. They are a part of the list of 129 Peacekeepers that have died worldwide in 2015 in the service of peace. International Day of United Nations Peacekeepers is a day that was set aside to honor those that serve in some of the harshest environments in the world. Addressing the crowd that had gathered to commemorate the day in Juba, South Sudan, and the head of the UN Mission said that an enormous debt of gratitude is owed to our fallen heroes. “We owe an enormous debt of gratitude to our own fallen heroes. Today, we mourn the loss of 13 UNMISS peacekeepers who lost their lives over the past year, while serving the cause of peace. Among others who attended commemoration was the South Sudan’s minster of Humanitarian Affairs and Disaster Management at the Transitional Government of National Unite, Mr. Hussein Mar Nyuot who was the guest.